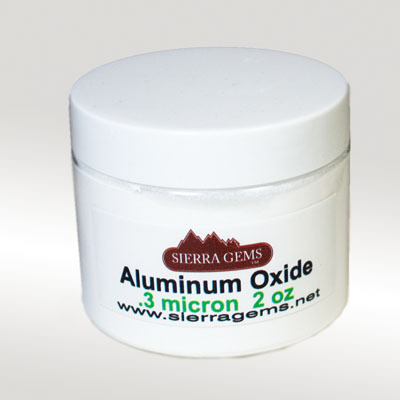 Aluminum Oxide - 2 Oz. at the Lowest Prices from Sierra Gems! 2 Oz. Jar .3 MICRON ALUMINA POWDER, 99.99% PURE ALUMINUM OXIDE. 9 MOHS in hardness. Works great on everything up to 8 in hardness. CZ and up you should use diamond powder or paste. Years ago this quality and fineness of alumina was marketed as Linde "A". Some faceters consider this the best polish for Tourmaline and Peridot. This was the polishing powder of choice for CZ until diamond powder prices came down.